Keyport is part of the Bayshore Regional Strategic Plan, an effort by nine municipalities in northern Monmouth County to reinvigorate the area's economy by emphasizing the traditional downtowns, dense residential neighborhoods, maritime history, and the natural beauty of the Raritan Bayshore coastline. 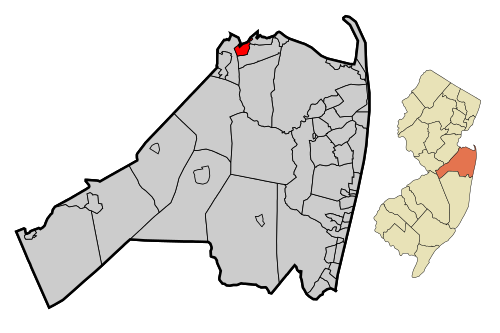 Keyport is located at 40Â°25â²56â³N 74Â°12â²06â³W (40.432114,-74.201529). According to the United States Census Bureau, the borough has a total area of 1.469 square miles (3.807Â km2), of which 1.395 square miles (3.614Â km2) of it was land and 0.074 square miles (0.193Â km2) of it (5.06%) was water. At the 2010 United States Census, there were 7,240 people, 3,067 households, and 1,693 families residing in the borough. The population density was 5,188.4 per square mile (2,003.3/km2). There were 3,272 housing units at an average density of 2,344.8 per square mile (905.3/km2). The racial makeup of the borough was 80.00% (5,792) White, 7.20% (521) Black or African American, 0.28% (20) Native American, 2.38% (172) Asian, 0.03% (2) Pacific Islander, 7.62% (552) from other races, and 2.50% (181) from two or more races. Hispanics or Latinos of any race were 18.26% (1,322) of the population. There were 3,067 households, of which 23.4% had children under the age of 18 living with them, 39.7% were married couples living together, 11.0% had a female householder with no husband present, and 44.8% were non-families. 37.3% of all households were made up of individuals, and 19.0% had someone living alone who was 65 years of age or older. The average household size was 2.35 and the average family size was 3.15. In the borough, 19.8% of the population were under the age of 18, 8.5% from 18 to 24, 28.9% from 25 to 44, 27.1% from 45 to 64, and 15.8% who were 65 years of age or older. The median age was 40.5 years. For every 100 females there were 97.2 males. For every 100 females age 18 and over, there were 95.6 males. At the 2000 United States Census, there were 7,568 people, 3,264 households and 1,798 families residing in the borough. The population density was 5,358.4 per square mile (2,072.4/kmÂ²). There were 3,400 housing units at an average density of 2,407.3 per square mile (931.0/kmÂ²). The racial makeup of the borough was 85.2% White, 7.0% African American, 0.12% Native American, 2.22% Asian, 0.04% Pacific Islander, 2.96% from other races, and 2.46% from two or more races. Hispanic or Latino of any race were 11.09% of the population. There were 3,264 households of which 25.8% had children under the age of 18 living with them, 39.4% were married couples living together, 10.9% had a female householder with no husband present, and 44.9% were non-families. 38.4% of all households were made up of individuals and 19.5% had someone living alone who was 65Â years of age or older. The average household size was 2.31 and the average family size was 3.11. 21.8% of the population were under the age of 18, 7.3% from 18 to 24, 33.2% from 25 to 44, 21.6% from 45 to 64, and 16.1% who were 65Â years of age or older. The median age was 38Â years. For every 100Â females there were 93.1Â males. For every 100Â females ageÂ 18 and over, there were 90.8Â males. The median household income was $43,869 and the median family income was $58,176. Males had a median income of $40,324 compared with $34,036 for females. The per capita income for the borough was $23,288. About 4.9% of families and 7.8% of the population were below the poverty line, including 4.7% of those under age 18 and 9.0% of those ageÂ 65 or over. As of 2015, the Mayor of Keyport is Republican Harry M. Aumack, II, whose term of office ends December 31, 2018. Borough Council Members are Council President Kenneth McPeek (D, 2015), Warren J. Chamberlain (R, 2016), Isaiah G. Cooper (D, 2017), Kenneth Howe (R, 2016), Sophia Lamberson (D, 2015) and Joseph E. Sheridan (D, 2017). In January 2014, the Borough council selected former councilmember Warren Chamberlain to fill the vacant seat of Clemente Toglia who had been killed on December 31, 2013, in a car crash before being sworn into office for his second three-year term. Chamberlain served on an interim basis until the November 2014 general election, when he was elected to serve the remaining two years of Toglia's term of office. On Election Day, November 7, 2007, Council President Robert Bergen was elected Mayor, taking the seat of two-term incumbent John J. Merla. Merla pled guilty to federal corruption charges on January 18, 2007, for accepting bribes to obtain municipal contracts. Bergen assumed the post of Mayor on January 1, 2007. For the 2014-2015 Session, the 13th District of the New Jersey Legislature is represented in the State Senate by Joseph M. Kyrillos (R, Middletown Township) and in the General Assembly by Amy Handlin (R, Middletown Township) and Declan O'Scanlon (R, Little Silver). The Governor of New Jersey is Chris Christie (R, Mendham Township). The Lieutenant Governor of New Jersey is Kim Guadagno (R, Monmouth Beach). Monmouth County is governed by a Board of Chosen Freeholders consisting of five members who are elected at-large to serve three year terms of office on a staggered basis, with either one or two seats up for election each year as part of the November general election. At an annual reorganization meeting held in the beginning of January, the board selects one of its members to serve as Director and another as Deputy Director. As of 2014, Monmouth County's Freeholders are Freeholder Director Lillian G. Burry (R, Colts Neck Township; term ends December 31, 2014), Freeholder Deputy Director Gary J. Rich, Sr. (R, Spring Lake; 2014), Thomas A. Arnone (R, Neptune City; 2016), John P. Curley (R, Middletown Township; 2015) and Serena DiMaso (R, Holmdel Township; 2016). Constitutional officers elected on a countywide basis are County Clerk M. Claire French (Wall Township), Sheriff Shaun Golden (Farmingdale) and Surrogate Rosemarie D. Peters (Middletown Township). The Keyport Public Schools serve students from pre-Kindergarten through twelfth grade. As of the 2011-12 school year, the district's two schools had an enrollment of 997 students and 98.0 classroom teachers (on an FTE basis), for a studentâ"teacher ratio of 10.17:1. Schools in the district (with 2011-12 enrollment data from the National Center for Education Statistics) are Keyport Central School (grades PreKâ"7; 496 students) and Keyport High School (grades 8â"12; 501). Keyport is credited as the birthplace of the "Lazy Susan", designed by William Bedle in 1845. It was the site of the professional dance debut of film star Fred Astaire in 1903 at age four, together with his sister Adele, as part of an act that earned a review that called the duo "the greatest child act in vaudeville. As of May 2010, the borough had a total of 25.51 miles (41.05Â km) of roadways, of which 18.70 miles (30.09Â km) were maintained by the municipality, 4.96 miles (7.98Â km) by Monmouth County and 1.85 miles (2.98Â km) by the New Jersey Department of Transportation. New Jersey Transit offers local bus service on the 817 route. NJ Transit train service is available nearby at the Hazlet and Aberdeen-Matawan stations on the North Jersey Coast Line. John Earle (born 1968), retired football player who played in the CFL for the Baltimore Stallions ebfore becoming a youth minister and evangelist. Juanita Hall (1901â"1968), actress best known for her role as "Bloody Mary" in the movie South Pacific. Garret Hobart (1844â"1899), Vice President of the United States from 1897 to 1899, spent his boyhood years in Keyport at a home on Broad Street, which was destroyed in the Great Fire of September 21, 1877. Also note, that US Census records show that Addison and Sophia Hobart, parents of Garret Hobart lived in Marlboro NJ up until 1880. It is very likely that the news article is incorrect in stating that Garret was a lad, when his father had removed to Keyport. 1870 Census records show Garret residing in the home of his in-laws in Patterson, NJ. Garret's mother Sophia, died in April 1880. It is very likely that Addison did remove himself to Keyport, but only after the death of his wife. Garret may never had resided in Keyport. Moe Jaffe (1901â"1972), songwriter and bandleader. Pat Kennedy, men's basketball coach at Pace University. Amy LamÃ© (born 1971 as Amy Caddle), performer, writer, TV and radio presenter, known for her one-woman shows, her performance group Duckie, and LGBT-themed media works. Georg J. Lober (1892â"1961), sculptor. Thomas J. Strickland (1932-1999), Impressionist painter. Horace M. Thorne (1918â"1944), awarded the Medal of Honor for valor during World War II. Raymond L. Wyckoff (1887-1939), politician, who served as Mayor of Keyport, member of the Monmouth County Board of Chosen Freeholders and as Monmouth County Clerk.